Hahahaha ummmmmmm, yeah. I don't know what is with the weird hand pose. Or why I felt the need to smile when the camera was covering my face, ha! Anyway, there is my hair. 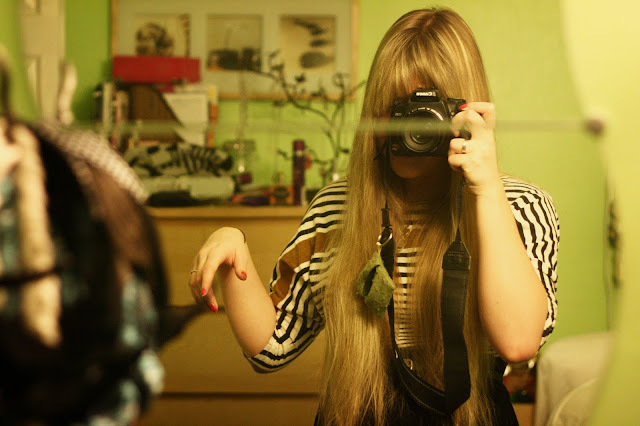 The reason I wanted to take photos of my hair is because I want to try out a bunch of different hairstyles. I'm always just wearing my hair down, like in these photos, or up in a bun. It's kind of boring. And my hair is long enough to try a bunch of different styles. I got the idea for this from the post 21 Days of Great Hair on Vivianna's blog. So, hopefully there will be 21 more blog posts about my hair. Except, the photos will be better. I hope. Ha! Anyways, I have been saving a few different hairstyles to try out on Pinterest, but I would love some suggestions! Your hair is GORGEOUS, lady! It certainly suits you well. 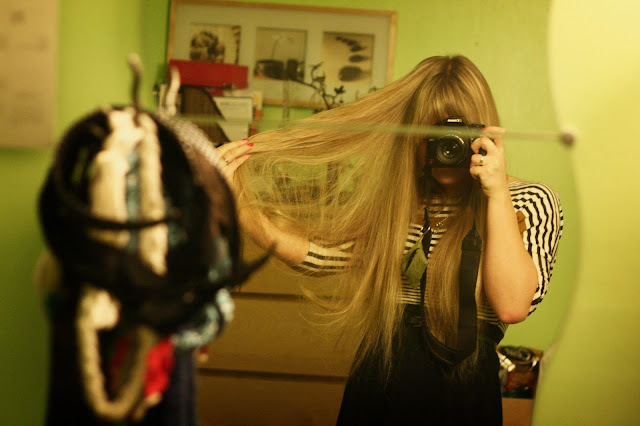 Your hair is beautiful like long golden beautifulness. It *almost* makes me wish having super long hair, but I think I like it better on other people cause then I don't have to deal with sitting on it and getting it caught in things and brushing it. Lol. Anyway, you also have the most gorgeous smile. your hair is phenomenal! I'm trying to grow my hair to your length. 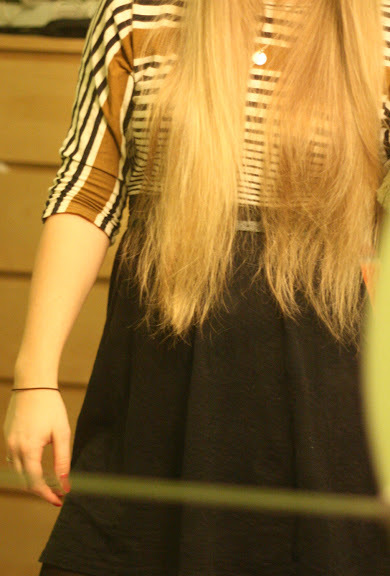 my hair grows pretty quickly, so it should only take another year to two years!! wow! your hair is soo long!! soo pretty~! 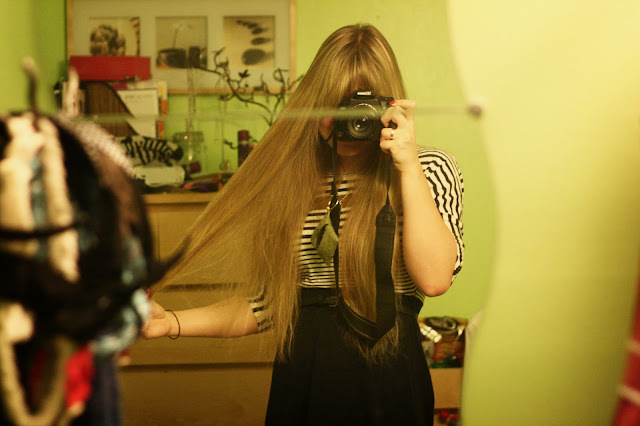 I am SO jealous of the length of your hair. I have been trying to grow my hair out for 4 years.. and can't get it past the current length!! argh..
also your style is just WAY to adorable!! 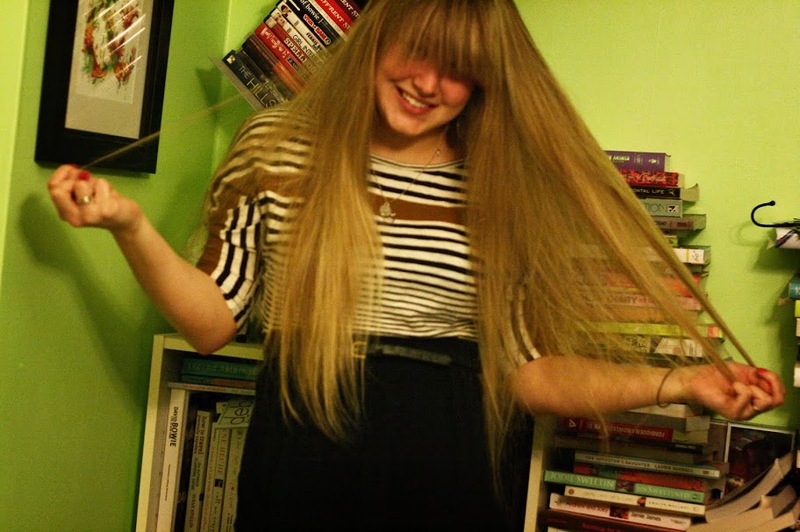 I miss having long hair sometimes because of all the cool styles you can do! I love braids at the moment, I think they can range from fun to professional, they can be messy or neat, and they're a great way to get your hair out the way on a hot or busy day. Refinery 29 has some awesome tutorials here http://www.refinery29.com/3-super-cool-braided-hairstyles-that-you-can-actually-do/slideshow?page=1#slide-1 and it's also worth searching 'hair' in their search bar. I hope you find some new styles that you love! ps I love your monochrome outfit, you suit stripes! I'm sooo jealous of your hair! Regretting cutting mine a little bit now... Especially coming into winter again- hair needs to grow faster! WOAH! Your hair is amazing! 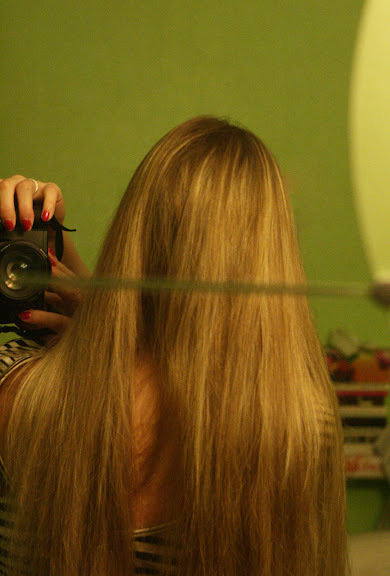 That's the length I'm saving for :D! Is it your real color?